Armed with fake papers, a handful of gold nuggets, and a snazzy custom-made suit, an unemployed schoolteacher with a singular passion for detective fiction sets out from small-town Bolivia on a desperate quest for an American visa, his best hope for escaping his painful past and reuniting with his grown son in Miami. Mario Alvarez's dream of emigration takes a tragicomic twist on the rough streets of La Paz, Bolivia's seat of government. Alvarez embarks on a series of Kafkaesque adventures, crossing paths with a colorful cast of hustlers, social outcasts, and crooked politicians—and initiating a romance with a straight-shooting prostitute named Blanca. Spurred on by his detective fantasies and his own tribulations, he hatches a plan to rob a wealthy gold dealer, a decision that draws him into a web of high-society corruption but also brings him closer than ever to obtaining his ticket to paradise. 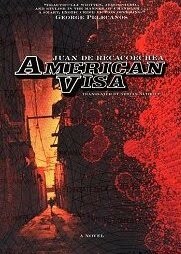 My 14th and final book for the Expert level of the 2010 Global Reading Challenge (and my second South American crime/thriller novel) was AMERICAN VISA by Juan de Recacoechea. I understand this is one of the few Bolivian books ever to be translated into English. A 'noirish' tale set in La Paz, it won the National Book Prize in Bolivia in 1994. I was quite curious about this taste of Bolivian crime fiction, because I spent a couple of weeks in Bolivia (as part of 4 months in South America) in late 2007, including a few days in La Paz, the highest capital city in the world (another Bolivian city, Potosi, is the highest city in the world). So I I thought I may have walked some of the same streets this novel deals with - well, at least the nicer, 'touristy' ones in the downtown area, anyway. In AMERICAN VISA, Mario Alvarez is an illusion: dressed in a custom-made suit and with box-ticking documents, puffed-up resume and bank statements in hand, he looks a likely candidate to get the visa he needs so he can redeem the plane ticket to Miami sent to him by his son. But really he’s an achingly desperate, unemployed school teacher from rural Bolivia who’s trying to bluff his way out of the country. Scared by the thoroughness of consular staff who want to verify his impressive but fake documents, he turns to a ‘fixer’ who’ll get him the visa for $800. But where will a near-broke Mario get such a fortune? Inspired by his love of hardboiled detective fiction and propelled by despair and desperation, Mario embarks on a series of bizarre adventures while concocting a plot to come up with the money. Along the way he drifts past an array of unique and unforgettable characters. Juan de Recacoechea reputedly wrote AMERICAN VISA as “an antidote” to the growing wave of Latin American magic realism. Job done. AMERICAN VISA is an unusual novel, a blend of mid-century noir, existentialism, and farce. This book was quite different to the crime/thriller novels I usually read, but I found myself hooked, and really enjoying it. It is reminiscent of that classic mid-20th century American noir, with its dishevelled hero, mean and gritty streets, and situations that unfold into all sorts of unplanned bad places and outcomes. Recacoechea's writing probably shines most in his evocation of La Paz, a bustling city full of change and history, and the sense of disconnect and desperation felt by the 'hero'. AMERICAN VISA won't necessarily be enjoyed by all crime and thriller fans, but there is plenty of merit, interest, and thought-provoking themes to be found within its pages. This book was originally reviewed for Dorte Jakobsen's excellent 2010 Global Reading Challenge.